Nursing facilities will conduct, document, and annually review a facility-wide assessment, which includes both their resident population and the resources the facility needs to care for their residents (§483.70(e)). The requirement for the facility assessment may be found in Attachment 1. The intent of the facility assessment is for the facility to evaluate its resident population and identify the resources needed to provide the necessary person-centered care and services the residents require. Resident profile including numbers, diseases/conditions, physical and cognitive disabilities, acuity, and ethnic/cultural/religious factors that impact care. Services and care offered based on resident needs (includes types of care your resident population requires; the focus is not to include individual level care plans in the facility assessment). Facility resources needed to provide competent care for residents, including staff members, staffing plan, staff members training/education and competencies, education and training, physical environment and building needs, and other resources, including agreements with third parties, health information technology resources and systems, a facility-based and community-based risk assessment, and other information that you may choose. Input from resident council, residents, families and representatives: Please delete if not going to obtain, please unbold and don't italicize if using. 11/28/2017 The facility will update this assessment whenever there is a change that would require a modification to any part of the assessment. Indicate the number of residents you are licensed to provide care for: 98 with 2 physical nursing stations and 4 medication carts and 2 treatment carts. Indicate your average daily census: 80-85. The facility does not have a distinct part and residents are admitted to beds in which is appropriate for their diagnoses and individual needs. The average admission and discharge rate from November 28, 2016 through November 28, 2017 was 322 admissions or an average of 27 admissions per month and 249 discharges or an average of 22 discharges per month. Staffing needs are flexed depending on the number of admissions and discharges and the acuity of the patients. Consider if it would be helpful to describe the number of persons admitted and discharged, as these processes can impact staffing needs. The facility accepts residents with the following diseases, conditions, physical and cognitive disabilities, or combinations of conditions that require complex medical care and management as listed in the chart below. The facility also will care for those existing residents who have declined and/or developed the conditions below after they have been medically stabilized or per the individual’s or representative’s preferred intensity of care. The process for admitting new residents is to have a clinician review the referral to determine whether the facility has the skill set to take care of the needs of the resident. If the facility has not admitted a resident with the current diagnosis or treatment, the facility would hold off on the admission while education and training would be provided to the line staff, equipment and supplies would be obtained and the policy and procedure would be revised and updated prior to the admission. For residents who are current residents and have developed a diagnosis new to the facility, the Director of Nursing would contact the Medical Director and/or attending physician to determine whether the facility could meet the needs of the resident. If it determined that the resident will require a higher level of care, the resident would be transferred to the hospital. If the resident is deemed stable to stay at the facility, the Director of Nursing and/or Director of Staff Development would arrange education to the staff through the assistance of the Medical Director and/or attending physician so the resident receives the necessary care and services. The facility also maintains a relationship with the Woodland Clinic and the Nurse Practitioners have and will provide education to staff regarding various diagnoses, assessments and interventions. In addition, the QAPI Services Team which have a team of RNs, Nurse Practitioners, Pharmacists and Registered Dieticians are also available to provide ongoing education to meet the needs of the residents by providing essential education. The facility does not have a distinct part or specialized units. Although the front hall is mainly used for the short stay resident, a resident could be admitted to any units in the facility. The residents who have dementia and cognitive disorders are not placed by their diagnosis of dementia but are placed by what is appropriate for their necessary care and services. Over the last 6 months from 06/01/2017-11/30/2017, the facility had an observed percent of 55.8% of residents with a psychiatric diagnosis and 2.9% of residents with an intellectual disability or developmental delay. These residents are admitted to rooms which are appropriate for their necessary care and services and not placed per their diagnoses. This material (template) was prepared by Telligen, the Quality Innovation Network National Coordinating Center, and revised by Health Services Advisory Group, the Medicare Quality Improvement Organization for Arizona, California, Florida, Ohio, and the U.S. Virgin Islands, under contract with the Centers for Medicare & Medicaid Services (CMS), an agency of the U.S. Department of Health and Human Services. The contents presented do not necessarily reflect CMS policy. QN-11SOW-C.2-09062017-02. 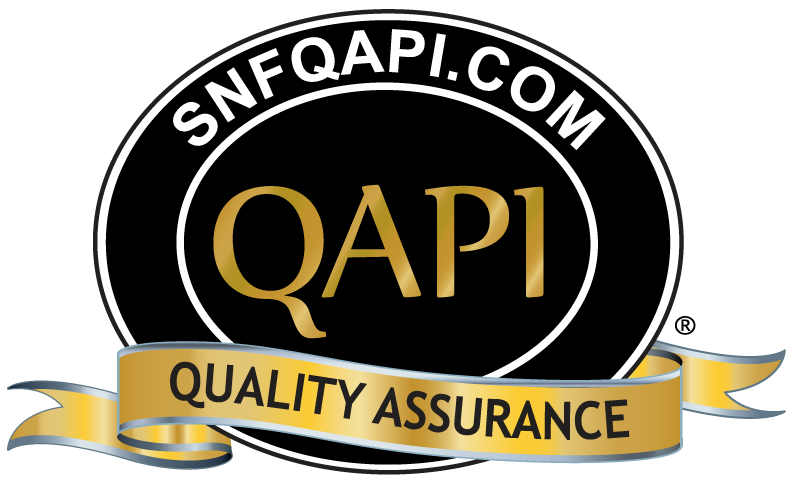 No permissions are required by SNFQAPI, LLC registered users to edit the contents of this tool to meet the individual needs of your facility. Consider if it would also be helpful to differentiate between long-stay and short-stay residents or other categorizations (e.g., unit floors or specialty areas or units, such as those that provide care and support for persons living with dementia or using ventilators). Indicate if you may accept residents with, or your residents may develop, the following common diseases, conditions, physical and cognitive disabilities, or combinations of conditions that require complex medical care and management. For example, start with this list and modify as needed. The intent is not to list every possible diagnosis or condition. Rather, it is to document common diagnoses or conditions in order to identify the types of human and material resources necessary to meet the needs of resident’s living with these conditions or combinations of these conditions. Describe the process to make admission or continuing care decisions for persons that have diagnoses or conditions that you are less familiar with and have not previously supported. For example, how do you determine, if you have the opportunity to admit a person with a new diagnosis to your facility, or to continue caring for a person that has developed a new diagnosis, condition or symptom, if you have the resources, or how you might secure the resources, to provide care and support for the person? Describe your residents' acuity levels that help you to understand potential implications regarding the intensity of care and services needed. The intent of this is to give an overall picture of acuity–over the past year, or during a typical month, for example. Potential data sources include RUGs, MDS data, and resident/patient acuity tools. Examples of different ways to look at acuity are provided in the tables below. Choose a methodology that works best for your organization. You may elect to use some or all of the tables below or choose your own methodology. Describe ethnic, cultural, or religious factors or personal resident preferences that may potentially affect the care provided to residents by your facility. Examples may include activities, food and nutrition services, languages, clothing preferences, access to religious services, or religious-based advanced directives. Describe other pertinent facts or descriptions of the resident population that must be taken into account when determining staffing and resource needs (e.g., residents' preferences with regard to daily schedules, waking, bathing, activities, naps, food, going to bed, etc.). List the types of care that your resident population requires and that you provide for your resident population. List by general categories, adding specifics as needed. It is not expected that you quantify each care or practice in terms of the number of residents that need that care, or enter an aggregate of all resident care plans here. The intent is to identify and reflect on resources needed (in Section 3) to provide these types of care. Identify the type of staff members, other healthcare professionals, and medical practitioners that are needed to provide support and care for residents. Potential data sources include staffing records, organization chart, and Payroll-Based Journal reports. Considering the following type of staff members and other professionals/practitioners, list (or refer to or provide a link to) your staffing data, directories, organization chart, or other lists that show the type of staff members needed to care for your resident population. Based on your resident population and their needs for care and support, describe your general approach to staffing to ensure that you have sufficient staff members to meet the needs of the residents at any given time. Examples of two different ways to look at your staffing plan are provided in the following tables. Choose a methodology that works best for your organization. You may elect to use one or both tables below or choose your own methodology. It may be helpful to review specific staffing references in the regulation regarding the facility assessment (see attachment 1). For a discussion on how to determine sufficient staffing, see attachment 2, section 7.b. Describe how you determine and review individual staff member assignments for coordination and continuity of care for residents within and across these staff assignments. Describe the staff members training/education and competencies that are necessary to provide the level and types of support and care needed for your resident population. Include staff member certification requirements as applicable. Potential data sources include hiring, education, training, competency instruction, and testing policies. It may be helpful to review specific references in the regulation regarding the facility assessment (see Attachment 1). List (or refer to or provide a link to) all staff members training and competencies needed by type of staff member. Consider if it would be helpful to indicate which competencies are reviewed at the time the staff member is hired, and how often they are reviewed after that. Communication–effective communications for direct care staff members. Resident's rights and facility responsibilities–ensure that staff members are educated on the rights of the resident and the responsibilities of a facility to properly care for its residents. Abuse, neglect, and exploitation–training that at a minimum educates staff members on—(1) Activities that constitute abuse, neglect, exploitation, and misappropriation of resident property; (2) Procedures for reporting incidents, of abuse, neglect, exploitation, or the misappropriation of resident property; and (3) Care/management for persons with dementia and resident abuse prevention. Culture change (that is, person-centered and person-directed care). Be sufficient to ensure the continuing competence of nurse aides, but must be no less than 12 hours per year. Include dementia management training and resident abuse prevention training. Address areas of weakness as determined in nurse aides’ performance reviews and facility assessment and may address the special needs of residents as determined by the facility staff members. For nurse aides providing services to individuals with cognitive impairments, also address the care of the cognitively impaired. Required training of feeding assistants–through a state-approved training program for feeding assistants. Identification of resident changes in condition, including how to identify medical issues appropriately, how to determine if symptoms represent problems in need of intervention, how to identify when medical interventions are causing rather than helping relieve suffering and improve quality of life. Cultural competency (ability of organizations to effectively deliver health care services that meet the social, cultural, and linguistic needs of residents). Describe how you evaluate what policies and procedures may be required in the provision of care, and how you ensure those meet current professional standards of practice. Include, for example, your process to determine if new or updated policies are needed, and how they are developed or updated. Examples of policies and procedures include pain management, IV therapy, fall prevention, skin and wound care, restorative nursing, specialized respiratory care for tracheostomy or ventilator, storage of medications and biologicals, and transportation. Describe how the management and staff members familiarize themselves with what they should expect from medical practitioners and other healthcare professionals related to standards of care and competencies that are necessary to provide the level and types of support and care needed for your resident population. For example, do you share expectations for providers that see residents in your nursing home on the use of standards, protocols, or other information developed by your medical director? Do you have discussions on what providers and staff members expect of each other in terms of the care delivery process and clinical reasoning essential to providing high quality care? List (or refer to or provide a link to inventory) physical resources for the following categories. Review the resources in the example below and modify as needed. If applicable, describe your processes to ensure adequate supplies and to ensure equipment is maintained to protect and promote the health and safety of residents. List contracts, memoranda of understanding, or other agreements with third parties to provide services or equipment to the facility during both normal operations and emergencies. Consider including a description of your process for overseeing these services and how those services will meet resident needs and regulatory, operational, maintenance, and staff member training requirements. List health information technology resources, such as systems for electronically managing patient records and electronically sharing information with other organizations. Consider including a description of (a) how the facility will securely transfer health information to a hospital, home health agency, or other providers for any resident transferred or discharged from the facility; (b) how downtime procedures are developed and implemented; and (c) how the facility ensures that residents and their representative can access their records upon request and obtain copies within the required timeframes. Describe how you evaluate if your infection prevention and control program includes effective systems for preventing, identifying, reporting, investigating, and controlling infections and communicable diseases for all residents, staff members, volunteers, visitors, and other individuals providing services under a contractual arrangement, that follow accepted national standards. Provide your facility-based and community-based risk assessment, utilizing an all-hazards approach (an integrated approach focusing on capacities and capabilities critical to preparedness for a full spectrum of emergencies and natural disasters). Note that it is acceptable to refer to the risk assessment of your emergency preparedness plan (§483.73), and focus on high-volume, high-risk areas.